A simple puzzle game with expanding pieces and soaring scores. From the creators of “Ice Cream Blast”, “Twisty Hollow” and “Match and Merge” comes a puzzle game you won’t be able to put down. You’ll constantly be uncovering new strategies with pieces that can change size and shape. Drag pieces through the grid; maneuver around and through the various shapes. Merge pieces of the same size, shape and color. When they get too big, they split back into smaller pieces EACH with the score of the large piece. Make smart matches and merges and see your score soar! Get a high score in each of the four stages and ever-changing daily puzzles. Earn achievements and climb the leaderboards with Game Center and Facebook. Compete with friends! Test your skills in Daily Flight, an evolution on classic gameplay, where every day is a unique skill-based puzzle based on one of five new challenges. Welcome to the neon grids of Imago, where you’ll need to merge increasingly large blocks to evolve. But the bigger the blocks, the easier it is to get gridlocked. 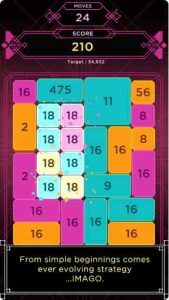 This wonderful game feels like a cross between familiar match puzzlers and Sirvo’s delightful Threes, but because every turn has potentially exponential implications, it plays unlike anything else. These big moves mean you’ll never be quite sure if you’re succeeding or failing until the last few moves—where your strategy will make or break the match. Love playing this game, as it has that “just one more game” feel. I’ve stayed up past 2am playing when I’ve had work the next day!The only flaw I have noticed is that I have the game on my iPhone and iPad with different high scores per device because there is no sync through Game Center.